Actually, the law clearly calls out subsidies for state exchanges only. 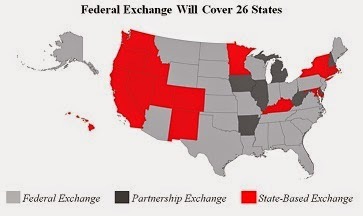 Liberals and their pet jurists have tried to twist this into covering the federally established exchanges after a majority of states refused to set up their own exchange. The Supreme Court announced on Friday it will hear a lawsuit that seeks to cripple Obamacare by invalidating federal subsidies for millions of Americans. In a surprising move, the justices agreed to have the final word on a challenge to the legality of federal subsidies in 36 states which declined to build their own state-run exchanges and handed some or all of the task over to the federal government. The decision is troubling news for the White House, which wanted to resolve the case in the lower courts so the Supreme Court wouldn't have to weigh in. The Supreme Court agreed to hear the case King v. Burwell after the challengers lost before a trial court judge and the 4th Circuit Court of Appeals, which upheld the subsidies. After the 4th Circuit ruling, the plaintiffs recognized they could only win the case at the Supreme Court, and so they appealed directly to the justices. The plaintiffs allege that the plain text of the Affordable Care Act confines the subsidies to "an Exchange established by the State" but not the federal HealthCare.gov exchange which serves residents of states that didn't build one.